I love my flowering plants, but annuals certainly don’t live up to their name and last for only a few short months. Since I’m still not in the habit of sprouting new seeds to have a continuous showing of the same plants throughout the year, I have to go through periods where some plants are absent. Red and white flowers - how patriotic! 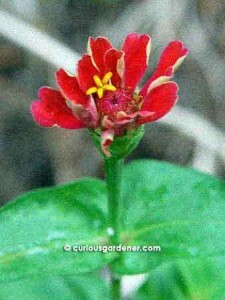 The first red Zinnia of this batch beginning to bloom. I can't wait for it to open fully! 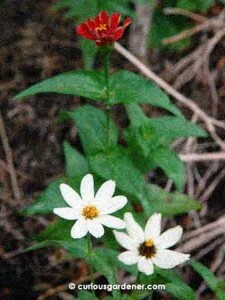 My white Zinnia flowers are smaller than their red counterparts, but they have many more blooms! 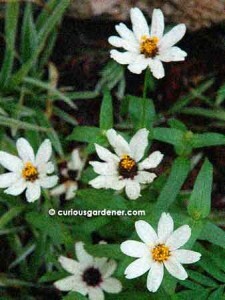 © 2011 curiousgardener.com All rights reserved.